A sharply divided three-judge panel of the Ninth Circuit ruled this week that Hawaii's restriction on the open carrying of firearms violates the Second Amendment. The ruling fills a gap--and is in tension with--the en banc Ninth Circuit's previous say-so in Peruta II that the Second Amendment doesn't protect concealed carry. (Ninth Circuit law now says the Second Amendment protects open carry, but not concealed carry.) For that reason, the case is primed for en banc review. The case, Young v. Hawaii, tested Hawaii's limitation on the open carry of firearms to those "engaged in the protection of life and property." The court first said that open carry "falls within the core of the Second Amendment." This required some careful navigating around the en banc court's prior ruling in Peruta II, and even taking that ruling on. The court, after surveying and glossing the history, simply concluded that "even though our court has read these cases to exclude concealed carry from the Second Amendment's protections, the same cases command that the Second Amendment must encompass a right to open carry." Restricting open carry to those whose job entails protecting life or property necessarily restricts open carry to a small and insulated subset of law-abiding citizens. Just as the Second Amendment does not protect a right to bear arms only in connection with a militia, it surely does not protect a right to bear arms only as a security guard. The typical, law-abiding citizen in the State of Hawaii is therefore entirely foreclosed from exercising the core Second Amendment right to bear arms for self-defense. It follows that [Hawaii's restriction] "amounts to a destruction" of a core right, and as such, it is infirm "[u]nder any of the standards of scrutiny." The ruling drew a sharp dissent, on all points. Between that, and the tension with Peruta II, this isn't the last we'll see of this case. Look for en banc review. In an extensive and scholarly opinion in New York v. United States Department of Commerce consolidated with New York Immigration Coalition v. United States Department of Commerce, federal judge Jesse Furman has denied in part motions to dismiss and allowed the case to proceed. Recall that the United States Commerce Department's announcement that the 2020 Decennial Census Questionnaire will include a citizenship question, which the census has not included since 1950, has provoked several challenges including the one filed in the Southern District of New York, New York v. United States Department of Commerce, raising constitutional objections on behalf of seventeen state plaintiffs, the District of Columbia, as well as six cities and the United States Conference of Mayors. The first count of the complaint is based on the "actual enumeration" requirement and avers that adding a citizenship question will "deter participation." The allegations in the complaint regarding the link between a citizenship demand and lower participation interestingly rely on the Census Bureau's own arguments and findings. The complaint alleges that consequences of lower participation is "an undercount" that will not reflect the accurate population of the plaintiffs, effecting their representation in the House of Representatives and the Electors. Two additional counts are based on the Administration Procedure Act. The New York Immigration Coalition complaint has "five nongovernmental organizations" as plaintiffs, challenging the Secretary’s decision on the same grounds as the states' complaint but importantly on the additional ground of equal protection. the Court rejects Defendants’ attempts to insulate Secretary Ross’s decision to reinstate a question about citizenship on the 2020 census from judicial review. Granted, courts must give proper deference to the Secretary, but that does not mean that they lack authority to entertain claims like those pressed here. To the contrary, courts have a critical role to play in reviewing the conduct of the political branches to ensure that the census is conducted in a manner consistent with the Constitution and applicable law. to say that the Secretary has authority under the Enumeration Clauseto ask about citizenship on the census is not to say that the particular exercise of that authority here was constitutional or lawful. The Secretary cannot exercise his authority in a manner that would violate individual constitutional rights, such as the right to equal protection of the laws. [citations omitted]. Nor, under the APA, may he exercise his authority in a manner that would be “arbitrary” and “capricious.” 5 U.S.C. § 706(2)(A);[citation omitted]. Plaintiffs here make both kinds of claims, and the Court’s holding that the Secretary’s decision was consonant with the Enumeration Clause does not resolve those claims. In his discussion of the equal protection claim (under the Fifth Amendment's inclusion of equal protection), Judge Furman relegated the animus argument to a footnote stating that it need not be discussed because he found that there was a sufficient claim for a denial of equal protection on the basis of Village of Arlington Heights v. Metro. Hous. Dev. Corp. (1997). Judge Furman concluded that the allegations of discriminatory effect — that inclusion of the citizenship question for all respondents will bear, in the form of diminished political representation and reduced federal funding, more heavily on “Latinos, Asian-Americans, Arab-Americans, and other immigrant communities of color” because the non-response rate is likely to be higher in such communities — were sufficient. There is nothing in the Court’s opinion [in Trump v. Hawaii] to indicate that its deferential review applies outside of the “national security and foreign affairs context,” let alone that the Court meant to unsettle decades of equal protection jurisprudence regarding the types of evidence a court may look to in determining a government actor’s intent. In fact, even with its “circumscribed judicial inquiry,” the Hawaii Court itself considered “extrinsic evidence” — namely, President Trump’s own statements. If anything, therefore, Hawaii cuts against Defendants’ arguments rather than in their favor. Judge Furman thus directed the parties to proceed with discovery, inform the court whether the cases should be consolidated, and whether a trial or summary judgment would be more appropriate. Judge Peter J. Messitte (D. Md.) ruled today that Maryland and D.C. sufficiently alleged emoluments claims against President Trump. The court denied the President's motion to dismiss the case, and will allow the case to move forward. We last posted on the case here, when Judge Messitte ruled that the plaintiffs have standing. Recall that Maryland and D.C. sued President Trump for violations of the Foreign and Domestic Emoluments Clauses for payments by foreign and federal and state governments in connection with the President and the Trump Organization's ownership of the Trump International Hotel on Pennsylvania Avenue. The President moved to dismiss for failure to state a claim, arguing that indirect and direct payments to him aren't "emoluments." The court disagreed. President Trump's motion required the court to define "emolument": Is it a broad term that could encompass the direct and indirect benefits that President Trump receives from his hotel (as the plaintiffs would have it), or is it much narrower, only prohibiting particular kinds of additional, outside compensation for the President? But before the court came to that question, it took a beat to broadly explain its options for constitutional interpretation. The court concluded that it should use text, original public meaning and executive branch practice as precedent to sort it out. As Plaintiffs point out, the Foreign Clause bans, without Congressional approval, "any present, Emolument, Office, or Title, of any kind whatever . . . . Use of such expansive modifiers significantly undermines the President's argument that this Clause was meant to prohibit only payment for official services rendered in an employment-type relationship. . . . The phrase "any other Emolument" in the Domestic Emoluments Clause suggests the same broad interpretation of the term. As to original public meaning, the court said that "[t]he clear weight of the evidence shows that an 'emolument' was commonly understood by the founding generation to encompass any 'profit,' 'gain,' or 'advantage,'" not limited to particular kinds of salary supplements. "Though the Court agreed that mere counting of dictionaries may not be dispositive, is nonetheless remains highly remarkable that "every English dictionary definition of 'emolument' from 1604 to 1806 relies on one or more of the elements of the broad definition DOJ rejects in its brief." As to purpose, the court said that it "does not see how the historical record reflects anything other than an intention that the Emoluments Clauses function as broad anti-corruption provisions," and not a more limited purpose that would simply prohibit the President from receiving only "specifically identified categories of compensation." Finally, the court said that executive branch precedent and practice also--and "overwhelmingly"--pointed toward a broad definition of "emoluments." With respect to the Foreign Emoluments Clause, Plaintiffs have alleged that foreign governments or their instrumentalities have patronized the Trump International Hotel, spending government funds to stay at the Hotel, eat at its restaurant, and sponsor events in the Hotel's event spaces. They have done so in some cases with the express intention to cater to the good graces of the President. . . .
[Plaintiffs plausibly plead] that the GSA's abrupt about-face position [first concluding that the President was, and later that the President was not, in violation of his GSA lease for failing to divest] was and is in direct contradiction of the plain terms of the Lease and that, by determining that the Hotel was and is in compliance with the Lease, the Federal Government bestowed upon the President an emolument in violation of the Domestic Emoluments Clause. In addition to foreign governments patronizing the Hotel, Plaintiffs claim that at least one State--Maine--has patronized the Hotel, spending state funds for its Governor and his entourage to stay at the Hotel and to frequent its facilities during an official visit of those officials to Washington, including an encounter with the President where Presidential action of interest to the Governor good place. [Plaintiffs plausibly plead] that, in connection with the Hotel, the President has received substantial tax concessions from the District of Columbia. The court's ruling went to the President acting in his official capacity, not individual capacity. "The Court will address the President's Motion to Dismiss the individual capacity claims against him in a subsequent Opinion." Before the court ruled on President Trump's motion, it took on Prof. Seth Barrett Tillman's argument that the Foreign Emoluments Clause doesn't extend to the President. The court said that the text, the original public meaning and purpose, and executive branch precedent and practice all point to the conclusion that the Clause does apply to the President. In its opinion in Lewis v. Governor of Alabama, a unanimous panel of the Eleventh Circuit has reversed the dismissal of a claim that the Alabama Minimum Wage and Right to Work Act, preempting the City of Birmingham's ordinance raising the minimum wage to $10.10, violated the Equal Protection Clause. After considering standing and Eleventh Amendment arguments, the panel's opinion, authored by Judge Charles Wilson, proceeded to the "heart of the matter" involving the district judge's dismissal of the plaintiffs' equal protection claims that the Minimum Wage Act purposely discriminates against Birmingham’s black citizens by denying them economic opportunities on account of their race; and the Act violates the political-process doctrine by transferring control from the majority-black Birmingham City Council to the majority-white Alabama Legislature. The court found that plaintiffs stated a claim on the intentional discrimination claim, applying the factors of Village of Arlington Heights v. Metro. Hous. Dev. Corp. (1997). The court found that there was definitely a racial impact and that the Act "bears more heavily on one race than another.”The court also considered "the rushed, reactionary, and racially polarized nature of the legislative process; and Alabama’s historical use of state power to deny local black majorities authority over economic decision-making." The court noted that the state's Act "responded directly to the legislative efforts of the majority-black Birmingham City Council, which represents more black citizens (and more black citizens living in poverty) than any other city in Alabama" and was "introduced by a white representative from Alabama’s least diverse area, with the help of fifty-two other white sponsors, and was objected to by all black members of the House and Senate. And it was accelerated through the legislative process in sixteen days with little or no opportunity for public comment or debate." The court concluded that these facts "plausibly imply discriminatory motivations were at play." Moreover, the court found that the district judge applied the incorrect legal standard when evaluating plaintiffs' complaint, a "clearest proof" standard "[r]ecklessly plucked from an unrelated line of precedent" and "contrary to decades of established equal protection jurisprudence." However, the court affirmed the dismissal of plaintiffs' equal protection claim based on political process, despite the facts, because "to the extent that the plaintiffs allege that the minimum wage policy was 'racialized' because the 'Birmingham African-American community strongly favored' it, that argument clashes with the Supreme Court’s clear instructions" in Schuette v. BAMN (2014). Thus, the case was remanded and can move forward on the "plausible claim that the Minimum Wage Act had the purpose and effect of depriving Birmingham’s black citizens equal economic opportunities on the basis of race, in violation of the Equal Protection Clause of the Fourteenth Amendment." In his opinion in League of Women Voters v. Detzner, Chief Judge Mark Walker of the Northern District of Florida found that the Florida Secretary of State's Opinion barring early voting on any university or college campus most likely violates the First, Fourteenth, and Twenty-Sixth Amendments, and issued a preliminary injunction. The issue involves an interpretation of the Florida's Division of Elections, under the Secretary of State, that Florida Statute §101.657(1)(a), passed in 2013, that permits supervisors of elections to “designate any city hall, permanent public library facility, fairground, civic center, courthouse, county commission building, stadium, convention center, government-owned senior center, or government-owned community center as early voting sites.” A question arose as to whether a particular hall on the University of Florida campus qualified and in response the state official issued an Opinion banning all university and college facilities for use in early voting. Put another way, the number of people who live and work on Florida’s public college and university campuses is greater than the population of Jacksonville, Florida—or the populations of North Dakota, South Dakota, Alaska, Vermont, Wyoming, and the District of Columbia. Judge Walker first applied the the Anderson-Burdick balancing test for less than "severe restrictions." (Recall in Burdick v. Takushi (1992) the Court upheld Hawai'i 's ban on write-in voting). Judge Walker stated that even assuming the state's opinion could be construed as a reasonable nondiscriminatory restriction, it imposed significant burdens on the plaintiffs' First and Fourteenth Amendment rights to vote, categorically prohibiting the use of on-campus early voting and thus "lopsidedly impacts Florida's youngest voters," a class of voters "particularly invested in early voting" with approximately 43 percent of Florida's college students voting early in 2016. These burdens were not justified by the state's interests — which the Judge stated "one must squint hard to identify"— in following state law, preventing parking issues, and avoiding on-campus disruption. This Court does not lightly compare contemporary laws and policies to more shameful eras of American history. But addressing intentional discrimination does not require kid gloves. Having found that there was a likelihood that plaintiffs would prevail on the merits, Judge Walker also found the other requirements for a preliminary injunction were met. The judge instructed the Defendant Secretary of State to issue a directive to supervisors of elections that they retain discretion to implement the Florida statute including any sites that may be on university or college campuses. Check out Aaron Tang's piece on SSRN, How to Undo Janus: A User-Friendly Guide. In response to Janus, where the Court ruled that fair-share violated the First Amendment, Tang argues that "lawmakers can amend state law to permit government employers to reimburse unions for their bargaining-related expenses directly." Check out Jonathan Adler's piece at the NYT, Will Kavanaugh Curb Sloppy White House Deregulation? Adler argues that Judge Kavanaugh "has expressed concerns about the Chevron doctrine," and "is not one to give [agencies] a pass." Still, Adler argues that "Judge Kavanaugh's concern about overbroad applications of Chevron should not be misinterpreted as hostility to regulation." The move abolishes the centralized process currently in place for the competitive selection of ALJs and places their appointments in department heads. The move has been criticized because it could politicize the appointments of ALJs, and thus politicize their work. As evident from recent litigation, Lucia may also raise questions about the method of appointing ALJs, including whether competitive examination and competitive selection procedures are compatible with the discretion an agency head must possess under the Appointments Clause in selecting ALJs. Regardless of whether those procedures would violate the Appointments Clause as applied to certain ALJs, there are sound policy reasons to take steps to eliminate doubt regarding the constitutionality of the method of appointing officials who discharge such significant duties and exercise such significant discretion. The EO doesn't apply to current ALJs. Under Lucia, some or all of these will require re-appointment by their agency head--again, depending on how similar they are to the SEC ALJs in Lucia (an question that agencies are currently working out). And notably the EO only changes ALJs' appointment, not their removal. Check out Geoff Stone's piece at The Huffington Post, It's Now Up To Senate Moderates To Save The Supreme Court. If Trump's nominee is confirmed on an essentially party-line vote in the Senate, especially in the aftermath of Republicans' unprincipled refusal to confirm Merrick Garland in order to bring about precisely this situation, this will mark the end of even the pretense of a nonpartisan, nonpolitical Supreme Court. It will undermine the credibility and integrity of the court and its decisions for decades to come. . . . So, what should the principled, moderate and wise Republican and Democratic members of the Senate to whom this essay is addressed do? They should refuse to confirm this nominee or any successor nominee unless a majority of both Republican and Democrats on the Senate Judiciary Committee supports confirmation. There is obviously much to read and discuss regarding the President's nomination of D.C. Circuit Judge Brett Kavanaugh but two pieces from the Washington Post today stand out. First, Aaron Blake considers Kavanaugh's comment, made immediately after thanking the president for the nomination, “No president has ever consulted more widely, or talked with more people from more backgrounds, to seek input about a Supreme Court nomination." Banks characterizes this statement as "thoroughly strange and quite possibly bogus." As Banks notes, it is a "completely unprovable assertion — and one that would require a basically unheard-of level of research to substantiate," although perhaps it is also "difficult, if not impossible, to disprove." It seems, Banks concludes, a "thoroughly inauspicious way to begin your application to the nation's highest court, where you will be deciding the merits of the country's most important legal and factual claims." Second, law professor Nancy Leong in her op-ed argues essentially that men need to enter the conversation surrounding abortion in a more honest manner: "Mathematically speaking, millions of men have such [abortion] stories. The one-in-four women who have had an abortion did not get pregnant on their own." Leong references the amicus brief by women attorneys regarding abortions as an effective communication with (soon to be former) Justice Kennedy and implies that a similar brief by men is long overdue. "For decades, men have benefited from the availability of safe and legal abortion. It’s time for men to start taking threats to reproductive freedom personally." 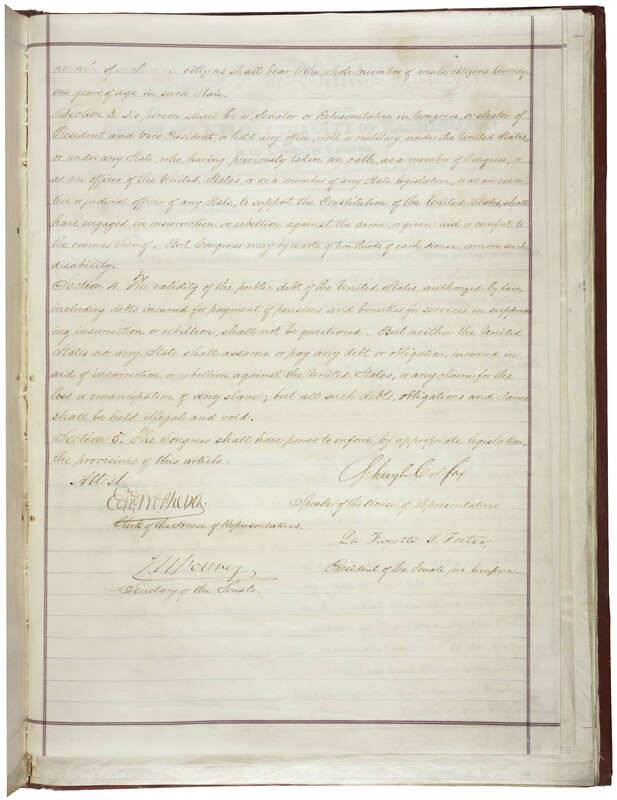 The Fourteenth Amendment was ratified on July 9, 1868. In a brief opinion in Cigar Association of America v. United States Food and Drug Administration, Judge Amit Mehta has enjoined the FDA's warning requirements regarding cigars under 21 CFR 1143.5, such as the statement "Cigar smoking can cause lung cancer and heart disease" pending appeal. In a previous opinion in May, Judge Mehta had sustained the FDA rule against a First Amendment challenge (as well as other challenges), finding that "Because the warning statements are factual and uncontroversial disclosures aimed at informing the public about the risks of cigar and pipe tobacco use and at correcting the public’s misperceptions about such products’ use, and because the [FDA] Rule does not impose these requirements in an “unjustified or unduly burdensome” manner, the Rule is constitutional" under Zauderer v. Office of Disciplinary Counsel of Supreme Court of Ohio (1985). whether Defendants’ asserted governmental interest in imposing the health warnings regime is a substantial one; the precise burden the government bears under Zaudererto compel purely factual and uncontroversial government speech; and whether a disclosure of the size and appearance mandated by the warnings requirements is so “unduly burdensome” as to chill protected speech. These are difficult legal questions, and the D.C. Circuit might well disagree with this court’s resolution of them. This court does not concur that Becerra requires an outcome different than the one the court reached— Becerradiffers from this case in multiple, material ways—but that disagreement does not diminish the merits of Plaintiffs’ motion. Becerra makes clear that Plaintiffs’ appeal raises serious legal questions. Yet while an important aspect of the Court's opinion in Becerra as we discussed was that abortion was not "uncontroversial," it does seem as if the cigar association cannot make the same claim as to the links between tobacco and cancer. Or can they? A case to watch as it goes to the D.C. Court of Appeals in the continuing saga of First Amendment challenges to government mandated warnings and disclosures by industries as in the 2014 DC Circuit en banc American Meat Institute v. U.S. Department of Agriculture and panel opinions in National Association of Manufacturers v. SEC (conflict minerals) and R.J. Reynolds Tobacco Co. v. FDA (cigarette labeling). Judge John A. Mendez (E.D. Cal.) yesterday granted part, but denied most, of the federal government's motion for a preliminary injunction against California's sanctuary-jurisdiction laws. The ruling is only preliminary--so goes only to the likelihood of success on the merits, and not the actual success on the merits--but it nevertheless signals the court's likely approach if and when it gets to the actual merits. This is just the latest ruling where a state promoting a progressive immigration agenda draws on conservative-Court-created structural features of the constitution (here, federalism). In particular, Judge Mendez writes that Section 1373 (the federal prohibition on states prohibiting their officers from communicating with the feds about detained individuals in order to determine their immigration status) likely violates the Court-created anticommandeering principle in Printz and (just recently) Murphy. Assembly Bill 103's Direction for State AG Review of Detention Facilities. This provision directs the state attorney general to review and report on county, local, and private locked detention facilities used by the federal government to house detainees in civil immigration proceedings in the state. The court rejected the government's argument that this provision interfered with the federal government's exclusive authority in the area of immigration detention (and was thus preempted), because the provision amounted merely to funding an authority the state AG already had. "The Court finds no indication . . . that Congress intended for States to have no oversight over detention facilities operating within their borders. Indeed, the detention facility contracts [California] provided to the Court expressly contemplate compliance with state and local law." Assembly Bill 405's Prohibition on Consent. This provision prohibits (on pain of fine) public and private employers from providing voluntary consent to an immigration enforcement agent to enter nonpublic areas of a job-site or to access an employer's records on its employees. The court said that the consent prohibition violated intergovernmental immunity, because "[t]hese fines inflict a burden on those employers who acquiesce in a federal investigation but not on those who do not." Assembly Bill 405's Notice Requirement. This provision requires employers to provide notice to their employees "of any inspections of I-9 Employment Eligibility Verification forms or other employment records conducted by an immigration agency within 72 hours of receiving notice of the inspection." The court said that this prohibition was likely valid: Federal immigration law "primarily imposes obligations and penalties on employers, not employees. . . . [T]he Court finds no indication--express or implied--that Congress intended for employees to be kept in the dark." Assembly Bill 405's Reverification Requirement. This limits an employer's ability to reverify an employee's employment eligibility when not required by law. The court said that it likely "stand[s] as an obstacle" to federal immigration law and is thus preempted. Senate Bill 54's Prohibition on State Law Enforcement Providing Immigration Information to the Feds. This provision prohibits state law enforcement from providing certain information to federal immigration officials relating to a detained person, except as required by federal law. The court wrote that Section 1373 (which prohibits states from prohibiting their officials from sharing this kind of information) likely violates the anticommandeering principle under Murphy (the Court's most recent foray into the principle, in the New Jersey sports-gambling case), because that case held that anticommandeering applies equally when Congress tells states what they may not do. But ultimately the court dodged the anticommandeering question by giving Section 1373 a narrow reading and recognizing that SB 54 contained an exception for complying with federal law--and thus holding that the two are not in conflict. The court went on to say that SB 54 also does not create an obstacle to federal enforcement, because it merely means that state officials don't cooperate with federal enforcement (and not that they actively stand in the way of federal immigration enforcement). Check out the conversation at Take Care on the deregulatory First Amendment. Charlotte Garden and Nikolas Bowie have posted so far. Posts to come from Caroline Mala Corbin and Catherine Fisk. Check out Josh Blackman's thoughtful and incisive post at Lawfare, Five Unanswered Questions From Trump v. Hawaii. We posted on the ruling here. In an opinion in Thomas v. Haslam, United States District Judge for the Middle District of Tennessee, Aleta Trauger, has held unconstitutional Tennessee Code §40-24-105(b) which revokes the driver's license of any person who has failed to pay court debt for a year or more. Judge Trauger had issued an extensive opinion in March, appended to the current opinion, detailing the issues, holding the plaintiffs presented a justiciable claim, certifying the class, and allowing for additional briefing on the summary judgment motions on the constitutional issues. The constitutional challenge to the driver's license revocation is grounded in Griffin v. Illinois (1956) and its progeny, which, as Judge Trauger explained "implicates both Due Process and Equal Protection principles in ways that defy an easy application of the Court’s more general precedents involving either constitutional guarantee alone" and should not be subject to a "pigeonhole analysis" of either strict scrutiny or rational basis review. However, Judge Trauger ruled that under Sixth Circuit precedent, rational basis must be applied, "which asks only whether the challenged policy is rationally related to a legitimate government purpose." Yet in the context of distinctions based on indigence, this rational basis should be one of "extra care" if "a statute treats the rich better than the poor in a way that will affirmatively make the poor poorer." the law is not merely ineffective; it is powerfully counterproductive. If a person has no resources to pay a debt, he cannot be threatened or cajoled into paying it; he may, however, become able to pay it in the future. But taking his driver’s license away sabotages that prospect. For one thing, the lack of a driver’s license substantially limits one’s ability to obtain and maintain employment. Even aside from the effect on employment, however, the inability to drive introduces new obstacles, risks, and costs to a wide array of life activities, as the former driver is forced into a daily ordeal of logistical triage to compensate for his inadequate transportation. In short, losing one’s driver’s license simultaneously makes the burdens of life more expensive and renders the prospect of amassing the resources needed to overcome those burdens more remote. Additionally, Judge Trauger held that the Tennessee statute does not afford procedural due process and that a "driver facing revocation for nonpayment of court debt is entitled to a pre-revocation notice and determination related to his indigence," to be developed by the state. While issuing an injunction against the statute's future enforcement, Judge Trauger ordered the state to "submit a plan, within 60 days, for lifting the revocations of drivers whose licenses were revoked under Tenn. Code Ann. § 40-24-105(b) and providing an appropriate process for reinstatement." Or, of course, Tennessee could appeal. In a recently updated and forthcoming article, Do Justices Time Their Retirements Politically? An Empirical Analysis of the Timing and Outcomes of Supreme Court Retirements in the Modern Era, by Christine Kexel Chabot (pictured) of Loyola-Chicago, she set out to explore whether or not Justices timed their retirements for political effect. Justices’ political retirement goals have often turned out to be wishful thinking. Some Justices found that they were relatively far removed from ideologies of party leaders (and potential successors) by the time they retired, and Justices who timed their retirements politically had limited success in obtaining like-minded replacements. In his opinion in Gary B. v. Snyder, United States District Judge for the Eastern District of Michigan Stephen Murphy dismissed a complaint alleging constitutional violations in the public schools in Detroit. After finding the plaintiff students had standing and that the complaint against Governor Snyder and other officials was not barred by Eleventh Amendment immunity, Judge Snyder dismissed the Due Process Clause and Equal Protection Clause claims. On the Due Process Clause claim, Judge Snyder noted that the constitutional right at issue is framed as "access to literacy" which "speaks to an opportunity" rather than simply literacy which is an "outcome of education." Using this definition, Judge Snyder distinguished the complaint from landmark cases such as San Antonio Independent School District v. Rodriguez (1973), rejecting "education" as a fundamental right. Nevertheless, applying the "standard" test to determine a fundamental right from Washington v. Glucksberg (1997) — "fundamental rights are only those 'objectively, deeply rooted in this Nation's history and tradition, and implicit in the concept of ordered liberty, such that neither liberty nor justice would exist if they were sacrificed'"— even through the lens of Obergefell v. Hodges (2015), Judge Snyder reasoned that fundamental rights are generally only "negative rights." But a violation of negative rights is not what the Complaint truly seems to argue. The Complaint explains, in great detail, that the instruction and resources in Plaintiffs' schools are inadequate. School districts at the time of the Constitution's ratification were formed 'when a group of farms came together and decided to construct a public building for schooling, where their children could gather and be taught reading, writing, and moral codes of instruction.' [citation omitted] The history evinces a deep American commitment to education, but runs counter to the notion that ordered society demands that a state provide one. The conditions and outcomes of Plaintiffs' schools, as alleged, are nothing short of devastating. When a child who could be taught to read goes untaught, the child suffers a lasting injury—and so does society. But the Court is faced with a discrete question: does the Due Process Clause demand that a State affirmatively provide each child with a defined, minimum level of education by which the child can attain literacy? Based on the foregoing analysis, the answer to the question is no. Judge Murphy concluded that the Equal Protection Clause claim was similarly not founded. The court repeats that there is no fundamental right and further finds that there is no racial classification because there to be a "relevant comparator school" requires not only that the school in question have a different racial composition that the 97% African-American schools in Detroit but also that the school "experienced relevant state interventions" like the schools in Detroit. Thus, rational basis scrutiny applies at its most deferential — whether "there is any reasonably conceivable state of facts that could provide a rational basis for the classification" — and the plaintiffs did not plead "specific decisions Defendants made concerning Plaintiffs' schools that could have been made differently" and were thus irrational. The dismissal of the complaint makes it ripe for appeal. The Fifth Circuit last week declined to dismiss a case against the Houston School District for failure to train its employees on Fourth Amendment student-search standards. The ruling shows the kind of outrageous constitutional violation, coupled with a complete failure to train employees, that could give rise to an unusual and "fortunately rare" failure-to-train constitutional case against a municipal government. Plaintiffs in these cases face a high hurdle, but this challenge shows the facts and legal arguments that just might be able to jump it. The case, Littell v. Houston Independent School District, arose when a school assistant principal took twenty-two sixth-grade girls to the school nurse for strip searches in order to find $50 that went missing during a choir class. The searches failed to turn up the cash. Two of the girls' mothers sued the District, arguing that its failure to train its employees on Fourth Amendment search standards violated their constitutional rights. "To be clear, the argument is not that the school district's written search policies are facially unconstitutional or that they caused the alleged constitutional violation by themselves. Rather, the 'official municipal policy' on which Plaintiffs attempt to hang Monell liability is the school district's alleged policy of providing no training whatsoever regarding its employees' legal duties not to conduct unreasonable searches." The district court dismissed the case, but the Fifth Circuit reversed. the school district . . . allegedly provides "no training whatsoever" as to how to conduct a lawful search. This straightforward factual allegation carries straightforward doctrinal consequences. . . . [W]e must credit Plaintiffs' factual allegations and proceed on the assumption that the school district has made the conscious choice to take no affirmative steps to instruct any of its employees on the constitutional rules governing student searches--even though at least some of those employees are regularly called upon to conduct such searches. In short, this case presents an alleged "complete failure to train" of the kind we have found actionable. The court warned, however, that "in the thirty years since Canton issued, actual cases reaching those extremes have proved fortunately rare"--and that the plaintiffs still may face this uphill challenge on the merits.